Making money from Amazon can become a nightmare if you do any of these mistakes! But for some bloggers and niche site builders, making money from Amazon can become a nightmare. Like every ads network or affiliate programs, Amazon reserves the right to ban you any time. If you break any of Amazon’s long list of Terms of Service (ToS), all of the hard work you’ve put into your niche site could fly out the window, and your niche site investment could take a serious hit. 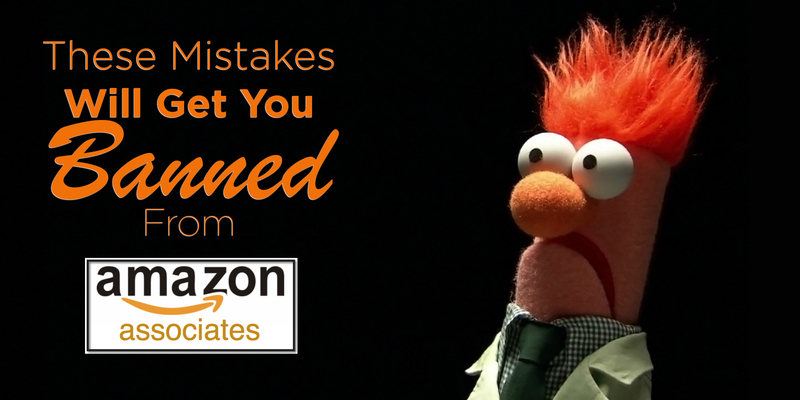 If you are an Amazon affiliate, or planning to sign-up, read about these big mistakes that will get you banned from the program. Amazon explicitly bans any use of affiliate links in “offline promotion or in any other offline manner,” and it can surprise some new users that that applies to email too. After all, email users use the internet to check their accounts, right? While that may be true, most email platforms also allow users to access their emails offline once they have been read on a mobile device or downloaded on a desktop email client. That means that using Amazon Affiliate Links in email can quickly land you in hot water. If you still want to make money from Amazon using email marketing, instead of sending traffic to Amazon, link to a page on your site that includes your Affiliate Links. Some niche site builders allow readers to subscribe to site which results subscribers getting new post notification directly on their email inbox. If you use your Amazon link on the first paragraph, users will get a clickable link on their email inbox. Clicking on the link later can get you banned. It is always advised not to use these kind of automatic email newsletter service. Amazon is very concerned with affiliates misdirecting audience, as the reputation of the Amazon depends on how affiliates are referring the site to visitors. The e-commerce giant wants users to know where they are being directed to. For this reason, Amazon bans link shortening that doesn’t make it obvious that you are sending users to Amazon. Amazon explicitly states under their 30th Participation Requirement. However, you can use Amazon’s default link shortener service, Amzn.to. Just like email, these two mediums are easy to access offline, which is a big no-no for placement of Amazon Affiliate links. Document is specific here, so it’s assumed that the policy for any E-book will be same. So include Amazon affiliate links on your E-Book or any other PDF documents only if you want to get banned. It’d be a pretty sweet deal if you could do all of your shopping online via Amazon using your affiliate link, and earn some Affiliates commission while you do. You will not purchase any Product(s) through Special Links for use by you or for resale or commercial use of any kind. That’s pretty clear cut language (not just the legal jargon), and an easy way to find yourself with a ban! In an effort to limit spam and make sure that their bans carry weight, Amazon only allows one account per individual. If you create more than one account, expect to get banned promptly. Some business owners may qualify for an exception depending on the nature and scale of their business, so feel free to contact Amazon and ask for some leniency. If you go ahead and create another account without reaching out first though, a ban is coming your way. Some new affiliates do this mistake often. They think of new accounts for new sites to keep track of the site’s earning. For this purpose, you don’t need new accounts. You can create upto 100 tracking ID from a single account and use 1 Tracking ID for new sites. 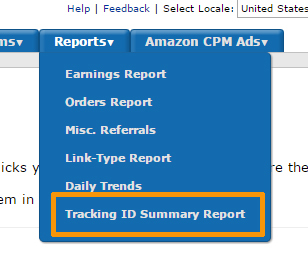 You can avail tracking ID wise report from the report section. Feel free to base your potential endorsement of a product based on how well that product is reviewed. In fact, relying on the user generated reviews on Amazon to determine the quality of products is a good idea overall. I use user’s opinion and develop content accordingly. But I don’t copy them directly. I just take the opinion, and write of my own. I make sure to publish high quality contents that both Amazon and Google loves! Don’t ever copy and paste those user reviews to your own site, or pass them off as your own. It might seem like an easy way to generate copy and bulk up the content on your site. Warn your freelancer about it before you hire them on freelance marketplace. Just copy-paste will land you with a banned account quickly. I have seen so many affiliates’ showing customer reviews on their site using WordPress plugins. This is a policy violation and any time can lead those marketers to ban. Some affiliates mention Amazon user rating on their site manually. Don’t do this. For rating, you can rate something similar to Amazon user rating naming ‘Editor Rating’ or something similar on your site. Every page of your website that sells an Amazon product needs to have a disclaimer explaining that you are an Affiliate, and will earn a small commission from sold products. Leave out this information, and you’ll land in banned territory quickly. An easy way to include this information is on the footer of each page that sells a product. From now on, put the following disclaimer to all of your niche sites. YourNicheSite.com is a participant in the Amazon Services LLC Associates Program, an affiliate advertising program designed to provide a means for sites to earn advertising fees by advertising and linking to (“your website name” (amazon.com, or endless.com, MYHABIT.com, SmallParts.com, or AmazonWireless.com). You can also announce however you want. Whatever disclaimer you draw up, make sure you have something announcing you are an affiliate. For all of my niche websites, I also publish an ‘Affiliate Disclosure’ where I mention everything. You can also do the same to be in safe side. Under item 2 of the operating agreement, Amazon clearly forbids using affiliate links on site that contain certain materials. One example of an unsuitable site “include those that: promote or contain sexually explicit materials. While this can be a vague term, it’s better to err on the safe side. Or, check in with Amazon before posting your links on a site that could be on the border line of explicit or violent. Amazon by default stores cookie information for users who click on your links, saving your affiliate information in case that user buys your linked product within a 24 hour period. But some savvy Amazon Affiliates have figured out ways to take advantage of this practice, and auto-tag users to make it look like a lot more clicks are coming in. I want to share an interesting story I read a couple years ago. Digital Point Solution founder Shawn Hogan followed a similar practice with eBay affiliate program, and he was the top marketer at eBay in terms of making money! eBay didn’t know the insight, so they offered Shawn a Private Jet! He made $28 Million with this system he found. However, later eBay sued him, FBI arrested Shaw and taken to court. If Amazon thinks you are engaging in this practice your account will be banned (and possibility of being taken to court 😉 ). To make sure you don’t trigger any false flags, avoid using iFrame’s on your site all together, as that’s how shady sellers use this trick. While paid placement of this kind can do a lot to make your site more successful, it can also lead directly to an affiliate ban. So be careful while generating traffic for your niche site using paid ads. Proprietary products like Kindle are trademarked too, and you can quickly violate these trademarks by including trademark information in your site’s Domain name. However, you can use trademarked name in your post permalink, as keyword in permalink is one of the on-Page SEO factors that help getting ranked in Google. It might be tempting to discuss things like price and how great of a deal certain items are in your content directly, but doing so runs afoul of Amazon’s good graces. Amazon changes the prices of items regularly, and putting price information right in your content means that your site will look obsolete when changes do occur. And worse than that, discussing prices in your content directly could result in a ban. I’m an affiliate marketer with Amazon for more than 2 years now. I didn’t even know there is any policy that might lead me to ban. I learned this from Joseph Magnotti from EmpireFlippers while I listed one of my niche sites for sell recently. Here is the email screenshot Joe sent me. Amazon affiliate accounts are getting banned for mentioning product price in content. An example how I was breaking Amazon’s term. How to comply with this term? Well, this is what I did in a different post. If you choose to display prices for any Product on your site in any “comparison” format (including through the use of any price-comparison tool or engine) together with prices for the same or similar products offered through any web site or other means other than the Amazon Site, you must display both the lowest “new” price and, if we provide it to you, the lowest “used” price at which the Product is available on the Amazon Site. You may not otherwise include price information on your site. So it’s clear that we can’t mention price manually, and the only option to show price is using theme like AuthorityAzon (the theme automatically update price from Amazon using product advertising API) or plugin like EasyAzon. While Amazon generally does not allow you to share affiliate links on sites you do not own, social network sites are something of an exception. However, there are a few important rules that govern sharing links on social media. In general, avoid all of the bannable offenses above, like sharing links on a sexually explicit or violent Social Media page or using Amazon trademark info in your page titles (like creating a Facebook page named – Amazon Discount and posting affiliate links of product with discount). In order to make sure that you are sharing acceptable links on your social media, be sure to click the “share” buttons from the Amazon Affiliates Stripe when you are logged into your affiliate account. 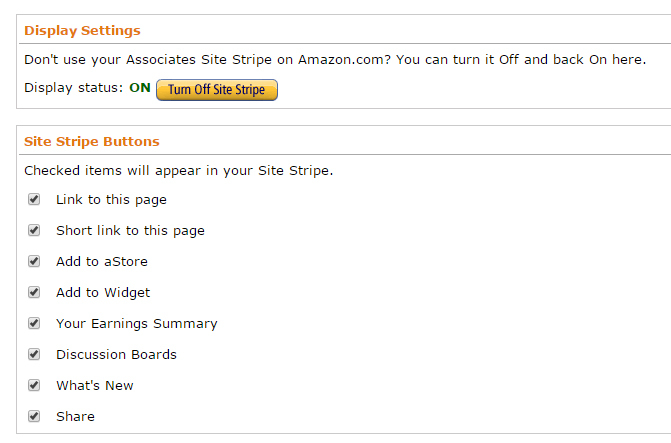 Note that, you will only get the option once you are login to your Amazon affiliate account, and your ‘Display Setting’ is on from ‘Associates Site Stripe Options’ which can be found in Account Setting. In general, Amazon wants to be sure that Affiliates are sharing links on high quality sites only. That means that if your site is all advertising copy, or totally devoid of content, Amazon won’t look at you favorably. When you first join as an Amazon Affiliate, you will need to meet quality guidelines on your site as far as content is concerned. And as long as you maintain that high level of quality, and make sure that your site contains genuine content and not entirely copy content, you should be fine. With copy content, not only Amazon will ban you as an affiliate, you will get a penalty from Google as well. Offering rebate is one of the tricky ways marketers use to increase sales. While this works for digital product marketplaces like Clickbank, there is no way to apply the same technique for Amazon affiliate program. The agreement clears it all. Offer rebate only if you want to get banned. I run a Facebook group of Amazon Affiliate marketers in my country. This ’90 Day Sales’ term came to my notice once one of the members posted the following screenshot on the group recently. According to the email, once you sign up for Amazon Affiliate program, you need to sell at least 1 product within 90 days, else you will no longer be an Amazon affiliate. However, the good news is, you can re-apply to become Amazon affiliate anytime later only on this circumstances. For more information about all of these common pitfalls, and all of the other things that Amazon wants you to know about being an Affiliate, make sure to check out the full Amazon Affiliate’s agreement. Have questions about any of the bannable offenses above? The best thing to do is to contact Amazon. Don’t risk it: your status as an Amazon Affiliate hangs in the balance. Thanks for the awesome post to protect our Amazon Affiliate Account. I have a question, If I hang an affiliate disclaimer as graphical image in every single page, is there any problem? Adding an affiliate disclaimer with images will also work. Amazon wants your visitors to know they are being directed to the site with an affiliate link, and you will make money if they purchase any product from the e-commerce giant. I was searching for Amazon above pasted questions and came to your site, Not only you cleared some of the point for Amazon TOS as Affiliate, you made policy compliant much more easier, I knew lot of it as I am associate, trying to do best to stay in term of Amazon. Keep up your good work, your article was very helpful. Thanks for the heads up Raihan. Yes, you are right. Showing data on your site using Amazon Product Advertising API won’t harm your Amazon Affiliate Account. So it’s safe to use AuthorityAzon or EasyAzon. know lot’s of ……… Thanks again for your great post……..
At number #10, Buy Paid Search Placements is not allowed. Could u give us more explanation about this? To add to what Al-Amin Kabir indicated – you cannot use a redirect in the second example. If a surfer clicks on a link in your PPC ad and is automatically redirected from your site to Amazon, a ban could be in your future. Bottom line is that PPC > Review Site > Amazon is OK if the surfer clicks the link on the review site, but not otherwise. But what if I have a Display Network campaign where I advertise banner ads in Google Adwords in other websites? I basically advertise Amazon products on other sites through the Display Network. Surfer gets redirected to Amazon product listing page automatically. Is that illegal with Amazon? Cause Google approved the affiliate link. Spiro, that is illegal with Amazon. Google doesn’t care what Amazon allows or not. You can link to your review page with an ad like that but not redirect directly to Amazon. Based on this thread, it seems that the same would apply to a Facebook ad. You can’t use an affiliate link to an Amazon product page in a Facebook video ad, right? Thank you for the confirmation and peace of mind. I am a bit confused. So if I use a PPC that redirects the a user to my site, after reaching my site and review its content, he clicks in one of the adds this would not create a ban? If he click on the link and automatically is redirected to amazon.com then it is ban? Please help me clarify. Not sure If I got it right. Everyday I try my best for know few new info about amazon from your Facebook group, I am new. So I want to know more about amazon, after then I will start. Thanks again for your great post. This is really very awesome Al-Amin. The funny thing is that I’ve never taken the time to read the entire Amazon associates TOS and i just discovered some mistakes I’ve been making as well without knowing its against their TOS. The major mistake being the issue of writing product prices on my pages especially on my product comparison table. I know this post must have taken you lots of time to put together but the truth is that its really helpful. You can add comparison table without mentioning price. the true is you can mention/put the price in your site..but you must put the disclaimer under the price mentioning that tht price is valid as the date of the post been published..this is what amazon staff respones to my email..
Hello Ijat, can you please send me the screenshot of the email to [email protected] so that I can update this post with the image? Additionally, you must either include the following disclaimer adjacent to the pricing or availability information or provide it via a hyperlink, pop-up box, scripted pop-up, or other similar method: “Product prices and availability are accurate as of the date/time indicated and are subject to change. Any price and availability information displayed on [relevant Amazon Site(s), as applicable] at the time of purchase will apply to the purchase of this product.” In the above examples, “Details” and “More info” would provide a method for the end user to read the disclaimer. Yes, you can display a price with the above conditions. Al-Amin, thanks so much for a detailed post! It is very helpful for Amazon affiliate beginners like myself. I would like to inform you that 90 days mentioned in #16 is no longer true. Hello Nadya, Thanks for the comment. By the way, can you please send me a screenshot of the welcome email to me at [email protected] so that I can add the picture to this post and update it? Thanks for the helpful tip! 180 days is a lot better than 90 days. Now my HDR Photography site can live on haha. Thanka for this helpful article. I will be glad if you answer my below question abour baning amazon account. 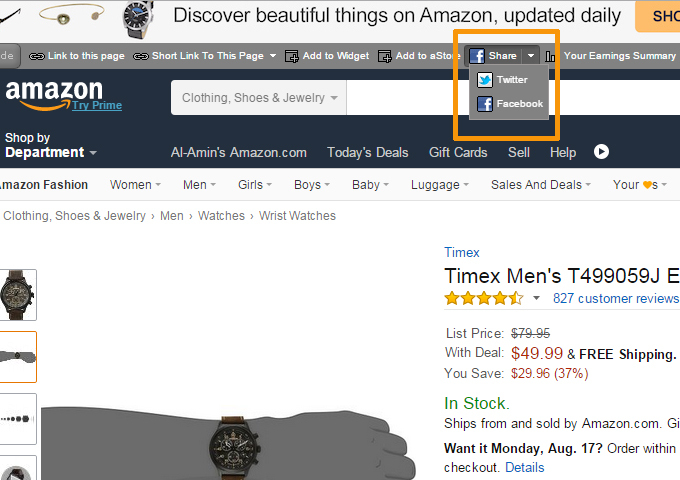 Can I post my amazon adfiliate links in my facebook profile, facebook pages, twitter profile?? How can I send my amazon affiliate link of amazon home page to my us clients? So that they can use my affiliate link when purchase from amazon. Will amazon ban me for these things? I have a question about using Amazon’s product images – sometimes to get images to display nicely on my site I end up saving a copy of the Amazon product image, and then cropping or resizing it to suit. I will then upload the image to my wordpress media library and I use the image with a custom URL to the Amazon product listing. Is this within the Amazon terms of service? No, I believe that saving the images locally and hosting them as your own is against Amazon’s ToS. You should either use their direct image link or make use of the Product Advertising API to get different images. I was not aware that you cannot mention amazon ratings in your web posts. But for the price, yes amazon did send me email about the prices, and that i must folow the rules, so i removed all of the prices. Thank you for sharing the Amazon TOS in detais. I was looking for this kind of list for last few days. Your post is helpful to avoid the mistakes. Thanks for such a great piece of content. There´s no translation of the Tos in Spanish so we can misunderstand some things. – Do they send you an e-mail so you can correct them or do they directly close your account. You told not to place direct amazon link in emails. And also mentioned to place links in first paragraph of the newsletters. 1) if I do email marketing to targeted people with my Niche site’s link is that okay? 3) as you mentioned ” Clicking on the link later can get you banned.”, what is the meaning of the term “later” ? Does it means 1/2 days or something else? Apologies for the too much questions, but i need these answers badly. You answers will help me to take the right decision. A little tongue in cheek humor? You mention in the title that the most common errors are #1 and #7. Thank you for your great article but I’m a bit confused by one thing. I understand that non-updated prices on an Amazon affiliate website can be a reason for banning, but what if you’re making articles for ‘best microwaves under 300 dollars’ or ‘this product costs just a little under 500 dollars’ and so on? It’s not specifically stating the price of the product, but the price range. What do you think about this situation, could this be a reason for banning? What do you think about hese 2 points? Indeed a great post about internet marketing mistakes. I am glad that you have covered the major internet marketing mistakes which almost every internet marketers do. Internet marketing is the best way of making money online and the best part about it is, It allow internet marketers to earn with few but potential visitors. We don’t need huge amount of traffic to earn. We only need 10 targeted visitors who can purchase the product. The most common mistake which internet marketers make is, they promote so many products at once without having any experience with them. To earn more, internet marketers pick every high paying product and start promoting them but don’t get any sales from them because they don’t focus on each product correctly that’s why they are unable to makes sales. Every successful internet marketer suggest to promote only those products which you have personally used. Oh my goodness! I didn’t know these restrictions. Thank you so much for opening my eyes. I’ll make sure to blog about this to inform my own readers and will credit you on this post. Congrats on this terrific article. Hello Alamin, Thanks for a Great Articles about Mistakes to get banned. Many thanks, brother or the awesome post to protect our Amazon Affiliate Account.Your post is helpful to avoid the mistakes. Al-Amin Bhai thanks a lot for sharing such a nice informative post . If you are referring to Adword compaigns they are not against the Operating Agreement. Be cautioned your are not allowed to put your link directly inside of it though. You must refer them to your website only. Also be sure to add http://abc.com to your account. Account Settings>Edit your website list. 2. About the Affiliate disclosure . 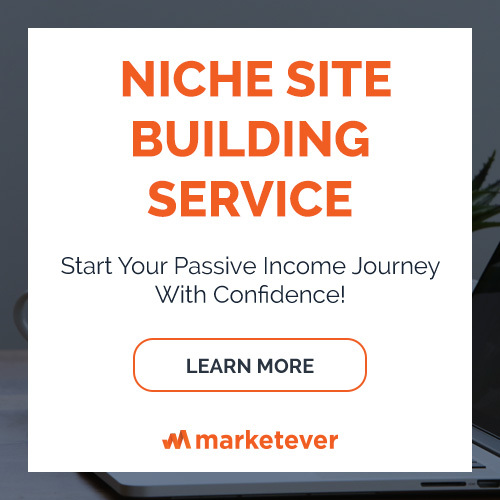 I saw many top leveled niche site disclose their affiliate disclaimer on a different page and link of this page are visible on menu, or on footer . Do I really need to publish the disclaimer on every page or a page link naming ” Affiliate Disclosure ” will be okay which is shown on every page ? All other information are really valuable and useful for us . Thanks again for this article . I read your post and it’s really very helpful for all of who use Amazon Affiliate Programme but I have a question if I use affiliate links to the Youtube videos description is amazon banned my account? Hi Al-Amin, I have a big question. Should I use funtion “cloak-hide” link of EasyAzon? Can I get ban with this? Thanks for this very useful article Al-Amin. If I become an affiliate partner of other sites in addition to amazon and give buyers different buying options, will that violate Amazon’s rules? Thanks in advance. Well, I am trying to learn affiliate marketing from last few months, but I am finding it very difficult, specially the conversion part, as I am not able to attract any sales expect one or two. Although, I am learning it quickly, and Now, I can say, I made a mistake by picking products without enough research and also, I reviewed the product without even using it, so all this resulted in failure. But I hope, I will improve on my skills and will succeed in Affiliate marketing soon. Great post, can using WordPress plugins like Amazon-product-in-a-post that displays products in a list type format with price using amazon API get you banned? When I read this article, my Amazon affiliate account was closed because I violated some of rules that mentioned in this article. Knowing Amazon’s ToS clearly is very difficult, its rule sometimes is changed/updated, this will make our account closed soon. Your blog covered every single top on amazon affiliated Marketing. But, this very blog post is very exclusive. Thanks for writing such an excellent post. This is one of the best and rare post. Your blog is great, itz very helpful to us. Realy bro proud of u. Please regular want to new post. Brother Al amin i am trying to create amazon niche site ,many many thanks for published this article ,its so helpful for me . Hi man, first of all great article. I have been sharing Amazon ref links to my social media networks. However, I have not listed my social media sites in Amazon account. Is it mandatory to add all social media sites (fb, twitter, reddit, pinterest, etc) to Amazon affiliate account? And I didn’t find Traffic Sources text field in Amazon dashboard/settings. I’m wondering this question too. I’ve been making a bit of money on Reddit, but fear my account will be shut down. Should I stop? Thank you for this valuable post on amazon affiliate. We recently started one amazon affiliate website and earned few bucks. This info really helps us how to promote amazon products without getting banned from amazon and most of the info that you mentioned in this post really helps newbie like us. Thanks again for posting valuable to amazon niche marketers. This is a powerful information. Thank you so much for this post, I have just found new tips to increase my knowledge about the amazon affiliate program. Thanks again. I read your article, I observed that some mistakes always for newbie.thanks for kindly information from us. 1) Dont use texts “check Best price on Amazon”, “check cheapest price on amazon” etc. If your prices isnt the cheapest or best you get a ban. 2) When you write an article “best product under 100$” all products prices must be under 100$, Alwyas. These post types are very risky. 3) Dont use any pop ups with amazon links. 4) I dont recommend visitors send to category pages but only product pages. 5) Dont use customized amazon banners and buttons. Should not send visitors to category pages but only product pages. Very effective information you published for amazon affiliate marketing. In Point No 9 , yu have mentioned that we should not use iframe…. But I stumbled across an amazon site which uses Iframe to dislay Amazon customer review which he pulls from Amazon website…. Check the Amazon Customer Reviews in Product Desription Page….You will find the amazon reviews displayed inside an iframe…..Is this allowed. ..You will find the amazon reviews displayed inside an iframe…..Is this allowed. This is really nice article and helpful to me or anyone. But I still confuse about some thing, special “6. Use Amazon User Reviews as Your Own” rule. It it right or wrong? If it’s wrong, what is exactly I need to do to make Amazon love? Thanks for nice article and your help! Thanks for your awesome guide. Can I use adsense? Is this safe for amazon affiliate account. Please let me know. I’d like know the impact of iframe on seo, is that not suitable to get good ranking on SERP? Amazon affiliate put three choices, firstone is text+image which contain iframe, secondone only text, plus thirdone is image. But im more interested by thev first choice, what i should do in this case? Hi, Thanks for detailed info. But I am little confused with price mention in the content. For example if I say, This earphone is awesome deal under $25 . and actual prices are is $15 which I don’t mention in the article. But as google has search query like above mentioned. Can I include in the article without risk of banning by amazon? Waiting for the precious reply. What happened to #7 – it seemed to be removed and the main article jumps from #6 to #8 – especially when #7 is featured as a main point in the title? So, must we update my website information? I think I was add and update it when i create new website. Quick question (this pertains to the missing #7): I just read through the Amazon Associates user agreement, and it said something along the lines of “don’t say you’re affiliated with us”, and then immediately afterwards said “you must say you’re affiliated with us. Which do I do….? I’ve seen plenty of others say that they are affiliated, but is there a limited way we can do it? Hi, Thanks for the guide. A quick question, Can I buy real traffic and push that to a landing page of my affiliate site? Will this cause a risk of banning my amazon account? Wow, thanks for guide – really answered a lot of questions for me! BTW I signed up recently and can also confirm, it’s now 180 days of no sales will result in a ban, not 90 days. What a great post! I have a quick question and it may be basic as I am new to affiliate marketing in general and amazon affiliates in specific. Suppose I have a site abc.com, which has high-quality relevant to say, fitness niche. I am planning to build another site xyz.com, which is intended to be an amazon affiliate site, where I intend to have amazon buy now buttons. Now, my questions are: 1) can I place links to my xyz.com in the posts in articles in my abc.com? 2) Is it okay to have a squeeze page in between abc.com and xyz.com to collect user e-mail ID? Is there anything else important related to my above questions? Thanks again for the helpful post! Is this 90 day rule in effect in all countries. I ask because there are 2000+clicks in my affiliate admin panel. but no sales. can this zero sales be due to the 90 day thing. will amazon tell me in admin panel that I am blocked because of no sale in 90 days. I have seen authority sites cloaking amazon affiliate links. Will it not get the account banned ? Thanks for sharing an awesome article. I have a question, Should we place a disclosure page like About Us in the footer, or it should be in the end of each article saying that you’re an affiliate. Thanks for this epic post vai. In my about page it mentions that I use affiliate links, is that sufficient? I Use easyAzon for the Prices, so I don’t have to write manually the exact price. I’m not located in the US, so I write about the best deals/how much you save buying from Amazon US comparing it with those products you can get it locally where I live. Anyone has any suggestion about that? I hope you can explain me something more about the link/script generated from within the Amazon page of the product you want to advertise. () that you can copy into your blog so that the image displayed will redirect you directly to the official page. (… qid=&sr=&linkCode=li2&tag=MYUSERID&linkId=…….) and this change everytime I get the link for the very same product. So, we cannot mention product price even in content and not comparison table, right? I am on my 3rd account. They never tell me why they ban my account, they just tell me to sign up again. Then I sign up, make more money and bam they ban me again. Now it’s 3rd time. I’m pissed because I’m reading all the fine print and they won’t tell me the problem, and it was on 5 sites and they won’t even tell me what site! God I hate them so much! Is this a new rule from Amazon? I haven’t seen this information on any Amazon affiliate tutorial. When you speak of sites having no copy content. Do you mean sites that are all pictures of products and then for example, a “view more” box and that links straight to Amazon? I have tons of content in my site (http://pizzaspotz.com), but would like to create a pizza gifts store with a gallery of images like pizza related shirts, pictures of each one, a small description in the box below with a “view more” link and that going to the amazon product page. Nice tips, but point 2 is not exactly right. You can use any shortener plugin to make links look shorter but you have to mention product name or Amazon so person know where he will be redirected. So you can’t name the link “brush-trends” but redirect to oral b brush. Avoid using bit.ly or goo.gl. Avoid bitly!! Bitly also make amzon.to shortner just like amazon shortner do ..
Hi, what happened to number 7? 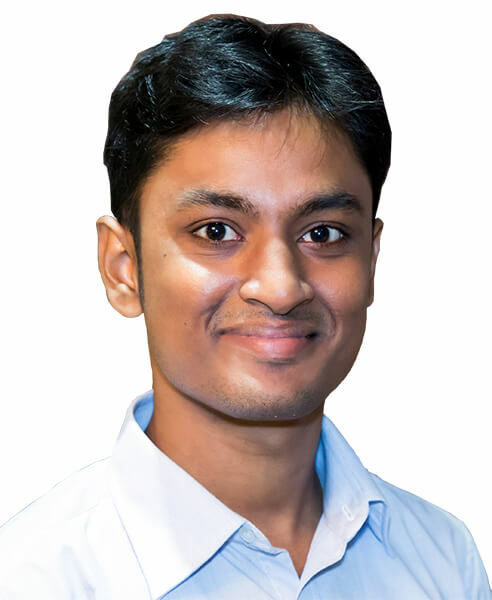 Thanks Kabir for this in-depth article regarding amazon affiliate policies. I need to ask one question is that can we discuss the product approximate price in the content (not in table format and actual price) ? I was doing research for exactly this subject and this guide fullfilled all my needs. We are currently building a page for a client that wants to start affiliate with Amazon. How about just the original price? Is that alright? Thanks for the tips, i have a question, can i sell my items on amazon and use my own affiliate link? My site got rejected from Amazon after I paid over $300 in advertisement. They never sent an email, I sent them an email when I couldn’t log in and they never responded. After I call them they said it was rejected for like of content. I told them I paid writers to write content and them told me they are not allow to explain the details. I’m not using them anymore. All the big companies out their will find a way to ban you for no reason at all. It does not matter how hard you try to follow the rules at the end you still get banned for no reason at all and you are always told its your fault. I carefully read the rules over and over again and did research on Google to find to see if I miss anything. This took hours of my time and lots of money and the end result is still the same. Banned for no reason. Can I use my Amazon Affiliate links in pop-up or exit intent Banners and ask users to buy from the links. I will also mention that I earn a little commission when they make a purchase. I think that you can’t ask to people to buy mentioning that this will make the website earn money. Am I right Al-Amin Kabir? So if I have numbers in my charts (lets say I give something like “around $40”) but Amazon is the ONLY service I suggest, doesnt it sounds its ok to you? I have a question to ask: Can we copy features or comparision table of amazon product page? I was going through your article and I must say it is really thorough. But my curiosity has led me to ask these questions? 1) So can I use amzn.to short link in paid ads? 2) or these links on my Facebook page directly? In this case, can I use the word Amazon in the post? Is there any rule like we have to reffer some free and paid kindle e books. After which we will qualified for payments? Just recently becoming an Amazon associate my self researching the ins and outs, I found within the condition of the program that promoting “free” kindle ebooks is ok but if found that you are prominently promoting free ebooks then you are asking for a penalty. No explanation is given why this is so, but it dose make sense. I have read a good few quality “free” kindle ebooks related to my niche that I have found helpful and can and properly will promote in my blog, solely as a good subject point for including quality content on my site. As you may know already, when ever you submit a google search a lot of the top serps placements contain the word “free” if you have included it in your search term or not. Human nature predicts that if it costs nothing then it is worth the risk. At the end of the gay there is always a cost. Not a big one. Singing up to a news letter tor receive further information for example. “Free” is a great marketing tool. There are many “free” ebooks available on Amazon Kindle. Once upon a time a budding writer had to convince a publishing agency to take them on. With the hight cost of print and production it was not an easy task for a writer to convince the publisher that their material was worth the investment. A lot of money could be lost and often the writer had to finance the cost of the first print themselves and only if they whey where able to. Kindle and other ebook providers have changed all this. With little expense to the writer they can now get their work published. Giving your creation away for “free” works well. No one knows who you are yet or how good your guide or novel is. But this doesn’t matter. If your subject and synapse attracts potential readers and they download it at no risk that they have made a financial loss then your book is getting circulated. Before you know it people are anticipating your next piece of work and are willing to pay a couple of pounds for the privilege. Now, Amazon doesn’t make money on free books. They are using “free” as a marketing tool. And in the same way so are associates that promote free books. They found your site because they where researching a potential purchase and they made one so it is win win all the way. wile they are there shopping they may also fill their basket with regular purchases or evan find a good deal on that TV they where looking at. can I have a screen shot of amazon rating ( with print screen) and put it to my site? You said you can’t include amazon affiliate links in ebooks, but KDP begs to differ. They said any affiliate links are fine as long as it points back to Amazon. In your example are prices that Amazon displays, so those are fine. You have not added your own code to show the prices. This is a great post about what not to do to get banned. Do you have information about the use of push notifications to redirect to Amazon? Any ideas if affiliate links are permitted in push notifications? I didn’t know about the manual price ban. Thanks for this post. It’s always good to know the exact TOS before scaling your amazon affiliate website. I had no idea about the price and rebate issues. Thanks. With regards to no. 16: No sales in 90 days, can one still re-apply to become an amazon affiliate using the same website or you will be requured to use another domain name? Again, would Amazon give another 90 days to make a sale? Thank you. Thanks for the advice, just signed up as an affiliate to Amazon and some of these tips will save me for sure. My site has had a makeover and the amazon banners work great with it! I have a question, is it possible to be an amazon associate and only share your amazon link through your own personal social media accounts? Facebook? Instagram? Or do you need an official website to register. Was searching for t’s & c’s as I find the amazon ones hard to read. Regarding the 90 or 180 day ting? I set up my associate account like 13 years ago. Only just discovered the internet then. Started selling some of dads collectible on ebay for him and thought my own website might be a good thing. Signed up for assists placed a few banners didn’t really know what I was doing. Let it all slip before it got started and forgot about it. Recently begun experimenting with Adsence and remembered my old amazon associates account. Not hard to forget really as they send me emails twice weekly for the past 13 years. I updated all my details including address. (had moved 3 times since lol.) payment details etc. Thing is I have not had a sale at all and my account is still active after all this time. Shoddent be long though, had 30 clicks since I have posted links from two days ago. If it is against Amazon’s TOS to list prices, how about price ranges? Your post didnt explicitly say that Associates couldnt use a format like Price Range: $10 – $50 . Thoughts? Thanks for this useful information to stay secure with our Amazon Affiliate Account. Thanks for sharing so much knowledge. It was the perfect guide for me to understand amazon affiliate program in a much easy way. I was just curious to ask that is it fine if we send traffic only from social media platforms? Does Amazon allow only social traffic like Pinterest, Instagram? Will it result in a ban if we don’t add much content rather make it look like an e-commerce store? Hope I could get the answer to my questions. Thanks in advance! 17. Do absolutely nothing wrong at all except not generating enough traffic to amazon. My account was canceled after my first sale simply because i did not have enough followers on my youtube channel and enough unique original content, wtf? My youtube channel is me flying drones, nobody else has videos of me flying drones, so how is that not original. Their loss, because i’m spending my thousands of dollars a year elsewhere now. I wonder how many millions of dollars they save in advertising by simply canceling accounts. Class action lawsuit soon i think. A question about advertising my Amazon affiliate site, and promoting it on social media. I recently chatted with a customer service person on Amazon and asked about advertising through Adsense, or on Facebook. He responded that I can advertise my website any way I want to, but I just can’t use Amazon’s links or photos in the ads or Facebok posts; for example, I can do an ad about my site, the type of content I have on it, etc., but I can’t include anything specific about an actual product. Is that also your understanding? If so, feel free to expand upon that and provide any examples of how we might advertise an affiliate website without breaking Amazon’s rules. Thanks for this. I’m glad I stumbled upon this while reading other articles. Building a niche site currently and I’m not sure when/at what stage should I apply for the Amazon Affiliate program. Nervous about not getting that first sale in 90 days. Hii can anybody help me on this .. If i make amzon.to link shortner from bitly rather using amazon associate strip will my amazon affiliate account will get blocked or not ??? You are free to use Amazon’s default URL shortening service, Amzn.to, for your Associated links. Amzn.to is hosted by Bit.ly. I am big fan of Yours and I read most of the article also. I want to ask a question that I have joined Amazon.in affiliate program in Jan 2016 but I was not so active in this program I became active in June 2016 that time was earning was not more than 1000 rs till Dec 2016 in 2017 Jan I become more active and earned around 5500 rs in 2 months and Amazon block my affiliate account saying I have violated operating agreement point no.12 and 13.. I received an email from AMAZON like this. I am really confused where to start and what to do..? “We have completed our review of your application to the Amazon Associates Program, which included a visit to the website where you planned to create links to our store. We found you listed the URL for your web site as: “NAME OF URL”. Your web site includes the unapproved use of Amazon.com trademarked words, images, or reviews. Other than images from AMAZON I have not used any reviews or words in my site. Of course I used the images on my product pages and tables from AMAZON only. What steps to take to reapply…? I have an amazon affiliate id in AMAZON INDIA AND AMAZON USA WEBSITE (with the same Email ID ) is that a violation ? Further If a potential customer lets say an INDIAN clicks on my USA link and then is redirected to the INDIA amazon store .. will i still get commission ? one for usa target and other is for india. or it is illigal to use 2 account from same i.p. and same pc. I have made 2 amazon affiliate account for my 2 sites, I have read at many places that it is not a big deal. Somebody really banned for more than 1 affiliate site? This was such a useful post thank you for explaining it all in simple terms. Now can you do it for all the other affiliates out there as I am really confused. I am only joking by the way about that. Here i am marketing books for competition exam but i am using books images direct from amazon website. Let me know if this is problematic for me or not. Hi – how up to date is this post? I’ve looked at the terms of service with Amazon about using their user reviews and see nothing in the current one (updated June 2017). Just wondering if this is still true? can put me in trouble. Thanks for writing this excellent article. It should be read by everyone that are planning to become an Amazon affiliate. I do not have a facebook account for my blog yet. 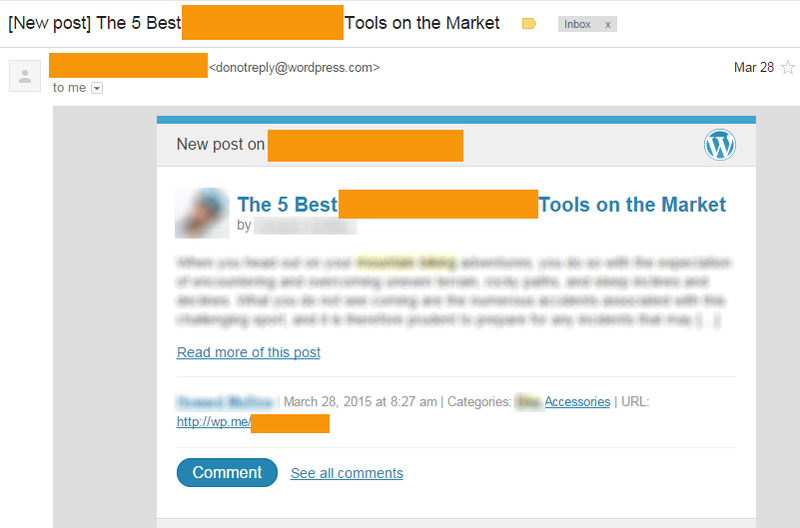 How do i share my affilaite link in my blog post? I received email from Amazon with content in below. How can I do in this case? Weve reviewed your website and determined that it doesnt meet the criteria for acceptance into Amazon Associates. It appears to be identical to many other websites. Sites without original content wont be ranked highly by search engines, which is the same as being invisible on the internet. As a result, the sites dont drive meaningful traffic that leads to orders placed on Amazon.com. Often, these types of sites are created by companies whose business is selling the completed sites for use in connection with affiliate marketing programs. Accordingly, weve closed the account under which you had been temporarily approved and that approval has now ended. Future applications using this website will most likely be rejected as well. We dont recommend that people open new websites just for the purpose of becoming Amazon Associates in most cases we dont feel that it would justify the effort or expense required. You would need to get in contact with the web hosting company that sold you this site for a refund or cancellation of the site itself. Amazon.com doesnt charge any fee for participation in the Associates program. In addition, Amazon.com does not provide this type of service nor are we able to comment on any business other than our own. Thank you! I just read this entire article. I’ve had some questions about the exact rules for Amazon’s affiliate program, and this is the best resource I’ve found with clear examples. I appreciate it! But I use this program in my own Facebook account which has over 4000 friends. They can’t see how many friends I have. Also there were around 2500dollars orders in 10 days. I’m in kind of a pickle – just got an email from Amazon saying they couldn’t verify my traffic sources for my account. I realized I hadn’t registered the sites I’m currently using (my ID is from an old defunct website). Whoops. I have 5 days to reply to them with info about my traffic sources. Do you think I should register my current sites I’m running under my current ID and then email them that info, or just let them kill my Associates ID and apply for a new one with the current sites? Kind of a confusing situation for me as I don’t want to get banned for life because I was dumb and assumed my associates ID could be used for any site. I’m still learning the amazon affiliate program. My question is can you put a amazon link in a FB post? Great article, really helpful, thanks. I’ve noticed when embedding YouTube videos to my site (which is an important part of my site) that this uses iframes. Would this be a problem? How can i take permission from amazon to do paid search platform ? One of my friends’ affiliate site got banned by amazon due to pricing issue. He was mentioning the price of each and every products in his website. I got to learn more points in your post which is very helpful(Because people often overlook the operating terms). Thanks for this valuable insight. Perhaps this is already in one of the comments. I see that at the top of your page, you are using a copywrited image of Google Associates. Will this not get you banned? I see so many unanswered questions on this post. So I will not bother asking anything. But I would like to say that YOU ARE BANNED from receiving the AWARD FOR TAKING TIME TO ANSWER POSTS. If you would like to be re-considered for this Award, please answer the questions on this post. p.s. I have Travel Banned you from USA. So it is perfectly OK and in-line with Amazon’s ToS to use customer reviews as long as you comply with the above. I am not convinced yet about some rules. My question is, if after linking to a product in my site I want to be sure that the link is taking me to that particular product and I click on it, will Amazon ban me? I Get nice detailed information on what we should not do with Amazon assosialtes account. Good Work! 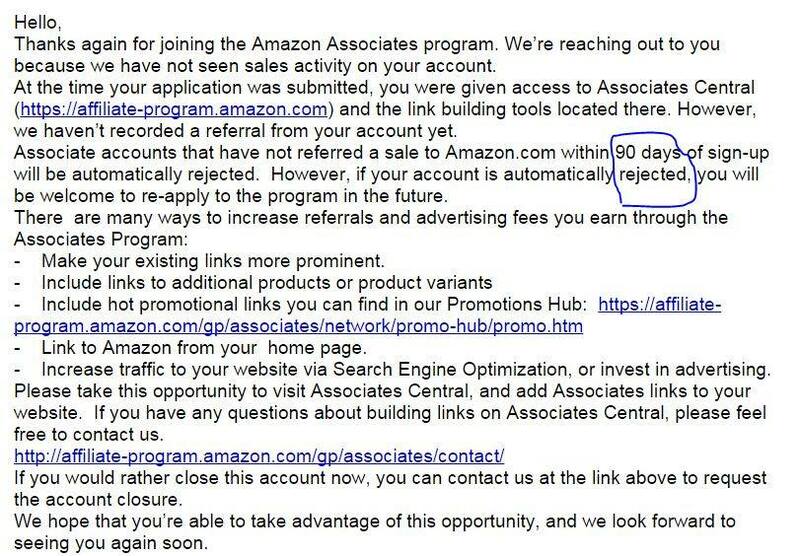 I feel lucky to have a sale under 90 days of amazon affiliate signup otherwise my account will be ban. Now focusing on improving my sales. I am trying to create a Chrome extension where in upon user enter search terms, will open products from many e-commerce sites with my affiliate id. Does that violate any policies ? Should I also mention that I am an Amazon affiliate on social media platforms too or just on mine website? Using Your Affiliate Link for Items You Purchase is the mistake I took. I have one question, Can we copy features of amazon product page? I have a question, amazon.in link and amzon.com link are same or different, I am targeting both audiences on my website. which link I should I prefer. I have a question. When you are an Amazon Seller, it is prohibited to ask your family and friends to buy your item in Amazon specifically by giving them the link. How about as an Amazon affiliate? If my sister or brother in the US buys from my niche website, is that okay? This post helps me so much I really appreciate & I correct some of my mistakes which I was doing before reading this article. If you really serious in Amazon affiliates sales then follow this all rules. Because if once your status goes down then it effects your image. If yet you do not start earning with Amazon Affiliate then don’t be sad. Do more & more hard work check, what you doing wrong why yet you not starting earning. Search in google hopefully it helps you. If once you start your earing then slowly-slowly you understand the whole process of this method. Good luck & All the best for all beginners who are serious about it. I am not using Amazon affiliate links on my websites yet, but will do because my Adsense earning is very low. BTW, your tips are very helpful. Will you please tell me that if i use a common format to write post and only replace keywords for a website . Will it be a cause of affiliate cancellation.?? And many many thanks for the post . It is really bookmark worthy post. And A solid guidance for beginners . If i read this post before my previous affiliate account would not be banned . Thanks for the comprehensive write up here. I am curious- have you seen any bigger bloggers break any of Amazons TOS and get away with it? Because I have. A very well known Youtuber and blogger includes Amazon affiliate links in his link magnet PDF giveaway. I was really shocked that he seems to be getting away with it. Being such a big influencer I would be very surprised if he didn’t know he was breaking the rules which leads me to the conclusion that despite what Amazon say, they make sly exceptions for bigger bloggers. What do you guys think? Hey Amin, truly valuable piece of information. One thing though, I am not able to make out from Point 1, if the caution made applies even, if you have subscribers to your site which do not use Email marketing . Just in my case, I have just started a site (http://flitmart.com) that is intended to promote amazon products and the site has few subscribers. Could it be a reason for getting banned in future by Amazon associate program ? I am contradicted by a sheer fact that a prominent site , say https://thewirecutter.com uses email subscription despite the fact that they are promoting Amazon products are they are making BIG fortunes. You can see by yourself at:https://thewirecutter.com/reviews/best-bike-rack-for-cars/ . And one thing more, I have noticed they are using link forwarding, if not cloaking. Please, enlighten ! If I do mention prices in my post. I always mention the higher price. Example $49.99 = around $50. Does anyone know if this is ok? P.S: I would advise though, to go through the Associate policy page for a clear understanding of. first off, Many thanks for putting such an invaluable piece of content in the larger interest of affiliate marketing community. As I can see, there are lot of questions unanswered here, I fear to tread in putting forth mine. But I am sure you’ll take time to revert. Is the normal subscription feature available with all WP sites also a violation of affiliate policy, If the site is promoting amazon products? My site doesnot use email marketing approach but is open to be subscribed. I never knew it was such a tightrope, but then reading their reasons why it is really quite easy to see why the rules exist. I have just joined Amazon and made a few sales only this past week, thanks a lot, this article probably saved me from getting banned! You have saved me from banning of my amazon account as i am using partial reviews from amazon customer’s feedbacks. What happened to #7? You post from #6 to #8. I really wanted to see #7. Dear Mr Kabir-thanks for this extensive list of tips. So if I give, say a free chocolate to a customer or other such gift (purchased from Amazon but not with my affiliate link) that will get me banned? It seems Amazon is taking the fun out of business! Thanks and best wishes, peace & blessings to you! Some of these are not true. At least for some of them. I will just talk about number 12 this time. I saw a lot of website owners and bloggers mentioning prices in titles and contents manually for years and some are more than 10 years and they are not banned. Never did. And I think they will ever be. Seriously, these owners doesn’t even care about the policy. In my experience, those who are violating number 12 that weren’t caught violate more than one policy. Anyway, when I asked about not banning them to Amazon assosicates rep, he talked like what do you know? there are many websites writing prices with Product Advertising API and blog companies that offer Product Advertising API. Of course I know some do offer it. I have my own websites and blogs and studied Amazon API for weeks I guess. I know he knows nothing because the blog company they use only offer HTML and I was part of the ones who writes Amazon’s deals and other Amazon related things on their websites. He asked me to offer their URLs which I did not. I thought like, it’s not my job, find them yourself. Anyhow..why can’t they find their blogs or websites if they close mine? They should have found their’s first it’s a very easy job. Their blog and website pages say out loud I’m violating the policy! Close my account! LOL Or do they know they are violating it but just leaving them like that? Either way, that’s so unprofessional. I really think they are being unfair. So do they just close the account they want to close or what? Thanks for Sharing Amazon Affiliate Rules.. I have to ask One Question ..I started my Niche Site and Where I have to also Add Comparison Table.So Which Iteams Information i have to add like Product name,Image,Reviews etc. Thanks for sharing this. I just wanted to whether it is safe to drive traffic through Adwords by bidding some of the relevant keywords to my website and then I send people to Amazon through affiliate links. Can I add “Check Today Price” as an affiliate link? Hi, if I were to go onto a site like Fiverr in order to increase traffic to my website, would that be permitted or would I be banned for that? I really like the article and having following this. Mobile Phone 1 -> $450 (Prices May Change). I would like to ask that wow many Amazon products can I put on my website’s article or post? Second, is it mandatory to sell any product within 90 days after getting the Amazon affiliation? Whew, I had no idea we couldn’t use the affiliate links in emails or pdfs. That seems so… counterintuitive. Those seem like exactly the kinds of places they would want you placing links. I wonder what their reasoning is for that. Anyway, you might very well have saved me from getting banned. Thank you! I was an Amazon affiliate marketer but unfortunately rejected twice. So, now I’ve been really afraid to start it again. I think I didn’t know many rules as an amazon affiliate program. should I use the ID before I used (not it’s banned)? images on Google image to use my site to promote? 3. So far, my commission at amazon was over $100 before I banned twice. Do Amazon send my money to me? Thank you so much for this informative article. Some of the affiliate mistakes you mentioned above i had no clue about. Thank you for this post, it’s very concise and easy to read. A question though: Is it ok to use “Buy On Amazon” purchase buttons? Hi. It got me curious on how affiliate really works. Before your blog, i saw a blog that has “affiliate disvlosure” at the footer of his page. But, the blog only contains posts with images and links, i thought it would direct me to amazon buy my surprise it lead me to other blogs that has amazon products displayed on their blogs. How can be an affiliate with that? It seems like he is promoting other blogs. Can you clarify this one? Thanks for the information. I really didn’t know that using the insert link functions and typing in how you wanted it to show was called link cloaking. Regarding #2, I inserted the link on my blog post and directly beside I informed readers that clicking the link would open up a new window to the Amazon.com site? Is that okay to do or would I still be banned? I just started with the Amazon Affiliate program a few days ago. Can I promote Amazon Echo in the Amazon Associates program? There are 2 doubts I’ve. 1. I’ve read that we can run Ads on the landing page and then there are links mentioned on the page. This doesn’t violates the Terms. 2. Also, can you tell me if we are using dynamic pricing directly on the website would that be an issue. I am running a fashion niche content website. Suppose I am promoting product A (listed in Amazon) with an affiliate link but the user clicks on that link and buys a different product, say product B. Am I eligible for a commission here? I would also like to know if I can just make the user land on amazon homepage, so if he/she buys anything from Amazon by clicking on that link I get a commission. Is it possible? the question is the first I must to promote the products amazon only website or not ? the question two is why amazon request the website when we are register ? Whoahhh, thanks for this! I was in violation by listing prices. I’m headed over to closely review the terms of Amazon Associates and join your FB group. Thanks for sharing this amazing article about Amazon affiliate and I loved it. Yourblog is so nice to me. I will keep on coming here again and again. I really impressed by this website, Now this my Bookmarked website. This was great. I had no idea that I’ve been risking it all in the last 30 days. It’s almost terrifying. Using quoted portions of user reviews was my grand idea to add more value. That and mentioning Amazon prices. I thought it made my reviews look more transparent and honest. What a laugh. Now I’m just grateful that Amazon hasn’t slapped me. I’m fixing those errors the moment I send this comment of thanks. So THANK YOU for bringing this to everyone’s attention. You just might have saved me. Thanks lot for writing interesting and important post for Amazon affiliate marketers. That’s really help to save Amazing account from ban. Carry on bro..
Dear Al-Amin, I have seen some reputed sites like bestreviews (.com) are using their own cusutom domain click cloaking to redirect visitors to amazon site. I wonder of it. Does Amazon allow this? If at all they allow this custom domain link cloaking, how to do the same? If possible please help. Thanks. Thank you so much for your post. I have a question, can I have a different email for shopper account and associate account? At the moment, I am using my student email, but it will be closed when I finish uni. So I am planning to use my personal account for my associate account. Thank you. Thanks for this outstanding article. I ask, could I get the ban hammer for using amazon CTA button that is provided by easy azon plugin? I mean, could that “buy from amazon” button be termed as trade mark violation in their TOS? Thanks in kind this outstanding article. I ask, could I get the amazon ban hammer for using the amazon CTA button that is provided by easy azon plugin? This was extremely helpful. I am about to start a new site (will be monetizing this with Amazon Affiliates Program) & wanted to know the stuff I should be careful about. And, your post is simply amazing. Thanks a lot. I want To Know that Can I Add Store Button in My Blogging Website, Inside I will Put The Products (Affiliate). So, is this Applicable? Thanks many, i really learnt a lot from this content. I will make the necessary changes to my Amazon affiliate promotions. Amazon couldnt approve my website because they noticed that i codified prices into my website… which is against their policy. I wish i read this post before they reviewed my website.Thanks for sharing. Thanks bro for this information. I have one account But i get 1 sale in last five month. still now my account good. In future any problem create my account? i lost my account or not. please reply me. Thanks for writing this content as i have started using amazon on my website i was not aware about all points, now i will keep above points in mind so that i do not get banned by amazon. Hey bro, Recently I started an Amazon affiliate niche site. this article is very helpful to me approve on Amazon associative.